Everyone’s favorite foul-mouthed baby Stewie stars alongside his faithful booze hound Brian in the Family Guy event of the year: Family Guy: Back to the Multiverse! Save Quahog from utter annihilation! 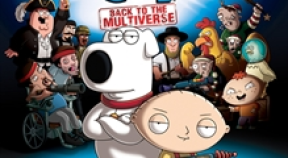 Stewie and Brian team up in an original Multiverse-spanning adventure to stop the evil Bertram from destroying everything!